This was the surprise of my year! I had done my homework beforehand, but had found nothing to stimulate me into visiting, except….the 7 locks including 4 in a staircase. Looking on the maps it seemed the site was sandwiched between the M6 the A5 and the main rail line from the Midlands to London. These intruding structures were all copies of the level route worked out by the canal builders centuries before – and they have shown no respect in general for the toils of their forefathers in following them! Hopefully, all that has changed now. For non-boaters the best (and maybe the only) access by road is down the A5 and turn left down the B road to Watford and park near Welton Station bridge. Walk North then in 300 yds you encounter lock 1. 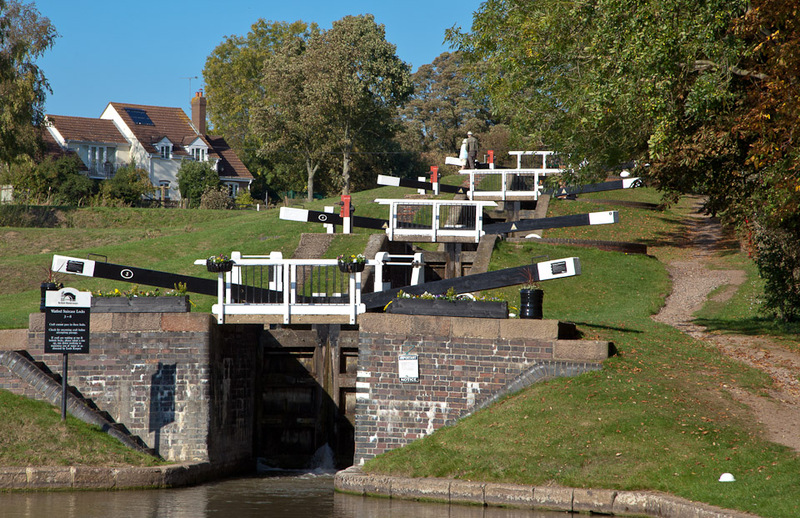 Boaters need to register their intention to ascend/descend the locks with the Lock Keepers before starting. The Lock Keepers will guide and assist you through the staircase. There are a few Do’s and Don’ts for the staircase locks, the “Red before White” maxim as can be gleaned from this link – I would ask the Lock Keeper. The gates are not heavy to manouvre compared to others on the GU.The Lock Keepers I met – one BW official and one volunteer – were very friendly and helpful. They will also discuss waterways matters with you with very interesting input. 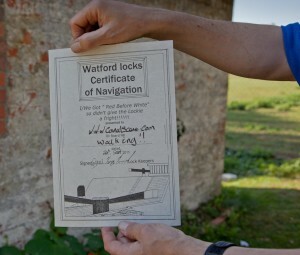 One super initiative is the awarding of a “Watford Locks Certificate of Navigation” to those boaters who have passed through the locks (and are still smiling?). You can see my certificate below, awarded for my toils in walking the locks and photographing the boaters’ navigations – Ok I cheated! Its a bit of a squeeze through Bridge 6 into Lock 1; but once you are through and have opened the top gates your view is of the oustanding vista of Lock 2 leading the eye towards staircase locks 3 to 6. These locks seem to be very well looked after and had wonderful flowers in bloom placed around them to provide a super rural ambience. Here is a slideshow of photos I took during my navigation. On the Google maps below use the +/_ buttons to zoom in/out and tthe arrows to move the view around. Below is an overview of the locks showing the proximity of the M1, A5 and North/South main railway line followed by a more detailed view. Below is a more detailed map of the area identifying the locks.